The old fashioned ice cream recipes below were quite popular in Grandma's day for making frozen treats. You'll discover there's nothing like the taste of these uniquely vintage flavors made from all-natural ingredients. Imagine: Frozen treats that are both healthy AND amazingly delicious. You can have it all! Pound coarsely two ounces of the best cloves in a mortar; add to it four ounces of white sugar; boil two quarts of milk and throw in the cloves and sugar mixed, let it simmer for ten minutes tightly covered; then add one quart of cream, with half a pound of white sugar, let these only scald; then press all through a hair sieve, and freeze it; a nice after dinner ice. Prepared in the same manner as the clove. Be careful to select the best stick cinnamon and only break it; not pounded as the cloves. Make sure the violet blossoms are 100% organically grown without the use of pesticides or chemical fertilizers. 1 quart cream, 1/3 cup Yvette Cordial, 3/4 cup sugar, 1 small bunch violets, few grains salt, violet food colouring. Mix first four ingredients. Remove stems from violets, and pound violets in a mortar until well macerated, then strain through cheese-cloth. Add extract to first mixture; colour, freeze, and mold. Serve garnished with fresh or candied violets; the light purple cultivated violets should be used and the result will be most gratifying. Directions for making Praline: Dissolve 1/2 cup sugar in 1/3 cup warm water. Add 3/4 cup shelled almonds or hazelnuts that have not been peeled, and boil for about ten minutes until golden brown. Pour onto a cold, oiled surface and leave until set. Then place in a clean cloth and hit with a rolling pin until the praline has broken into small pieces. Make either a Caramel or Vanilla ice cream (recipes found elsewhere on this website) and fold into it when well chilled, the praline; freeze again, and when hard let it stand 1 hour to ripen. Take one quart of rich cream, and put it to boil in a farina kettle (double boiler). Beat up the yolks of eight eggs, with one pound of pulverized sugar, flavour with grated nutmeg and half a pint of best brandy. Stir the beaten yolks and sugar into the boiling cream; stir constantly for one minute; remove from the fire and stir until cold. Lastly, whip in the stiff-beaten whites of four eggs. Freeze. Make a custard with the yolks of four eggs, one pint of milk, and one and one-half cups of sugar. While this is cooling, chop up one pound of crystallized fruits covered with one-half cup sugar, one wineglass of sherry, juice of one lemon. When custard is cold, add one quart cream and partly freeze, then add fruit. Jars of preserved ginger in syrup can be purchased in supermarkets and specialty food stores in most areas. Homemade ice cream with the spicy taste of ginger is much superior to the processed, store-bought variety. And, if you love to eat chocolate brownies or rich chocolate layer cake, then try it with a scoop of this old fashioned, ginger flavored ice cream on the side. Totally delicious! I love the taste of this creamy ice cream with its chewy bits of ginger — so amazingly flavorful! If you love the taste of ginger, you owe it to yourself to try the real thing! Six ounces of preserved ginger, one quart of cream, half a pint of the syrup from the ginger, sugar sufficient to sweeten it with to taste, and the juice of two lemons; pound the ginger in a mortar (or chop fine), add the cream, etc., and freeze in ice cream freezer. Add your favorite flavor to this old fashioned ice cream recipe. Sweeten one quart of cream or rich milk with half a pound of sugar and flavour to taste; put it over the fire in a farina kettle; as soon as it begins to boil, stir into it a tablespoonful of cornstarch or rice flour, which has been previously mixed smooth with a little milk; after it has boiled a few minutes, stir in very gradually six eggs, which have been beaten until thick, and take it off the fire; when quite cold, freeze it as ice cream. 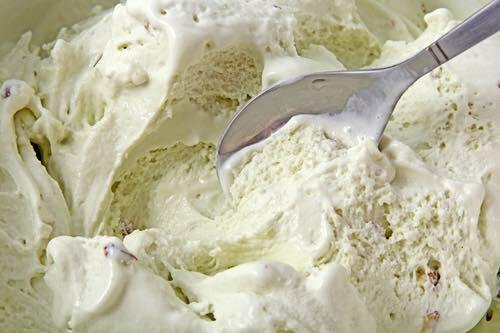 Some of the above flavors of ice cream are now thought unusual while others like eggnog have become more conventional. Clove ice cream was much esteemed in France, and violet and ginger were popular flavors in the late 1800s, in Victorian times. You will love trying them all. The old fashioned recipes can be adapted to modern ice cream freezers or used with old fashioned ice cream churns. You can make your ice cream the easy way in the refrigerator freezer. It'll turn out just fine whichever way you make it. The old fashioned flavors are good conversation starters, and they bring raving reviews. Above all, they are sure to please any discriminating ice cream lover.